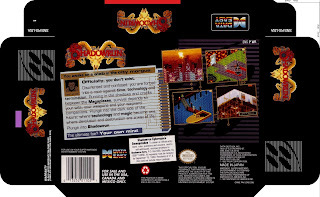 I didn’t really know about Shadow Run till recently, for some reason it had never even registered with me as a game I should play, let alone own. I think I only discovered it when looking at lists of ‘Snes games you should own that aren’t Mario or Zelda’ and noticing how regularly it came up. 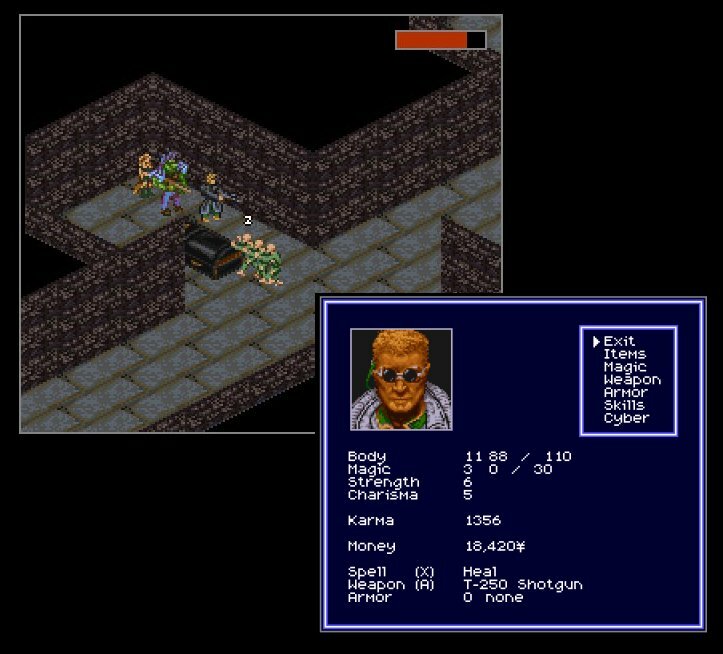 A dark cyber punk adventure game, based on a board game I had never heard of, that was equal parts Cyber Punk and Tolkien-esque fantasy – an odd blend that became infectiously compelling. I loved point and click adventures. 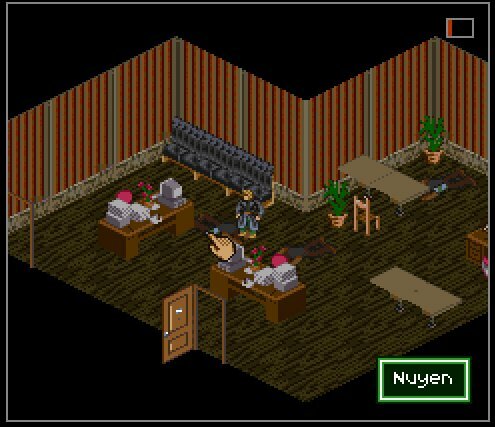 In the Nineties, as far as I was concerned Lucas Arts could do no wrong; be its Sam and Max, Monkey Island, Grim Fandango or Full Throttle I loved them all. Each had the perfect blend of humour, exploration and story. I always thought that these point and click games, so prevalent on the home computers, were absent on the consoles. On my SNES adventure involved triforces and swords, not rubber chickens with pulleys in the middle. start. The game makes no attempt to guide a new player in gently, you have no idea who you are, where you’re meant to be going or indeed how to control your avatar properly. Plunging you into a world where every second screen has someone shooting at you, seems brutally harsh and makes Shadow Run seem initially impenetrable. I even died, several times in the first 10 minutes just trying to figure out what I was meant to be doing. In a time of disposable emulation games, had I not paid for a copy of the game I may have moved on without progressing any further than 4 or 5 screens into the game. 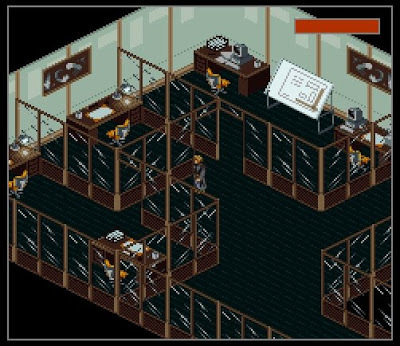 But persistence, yields rewards and despite the game being initially inaccessible, getting past it reveals a fascinating game rich in narrative, style and a surprisingly twisty neo-noir story. Place them near re-spawning enemies. a whole lot more enjoyable. So it was with a smile on my face that I repeated the same room, harvesting Nuyen (Shadow Run’s currency) and Karma (the games XP) levelling up my various base level attributes. After all, I don’t enjoy playing someone who is weak, I want to be a max stat powerhouse. Essentially as this made the start of Shadow Run closer to a Lucas Arts adventure game; the threat of death became an annoyance rather than a genuine risk. Progression through the game also follows similar ‘point and click’ game traits. It may be disguised but like Monkey Island and Grim Fandango you are looking for keys to open locks, although it’s rarely that literal. 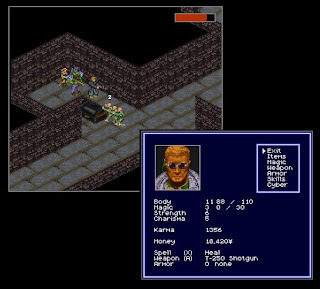 For example, early on in Shadow Run you need to get a ticket to a club to progress further into the story. The route to achieve this is not remotely logical, but it starts with giving an Iced Tea (Nintendo Censorship at its best) to a bar patron to ‘wake him up’. The Ice Tea being the Key which unlocks the patron. This drunk awake man will then be far more willing to talk and will give you the next clue about where to go, where to find a key or where the next lock is. The way the game does this conversation though is one of the finest aspects of the game, and is perhaps the one aspect of the game that has permeated many other games since. As you chat key words, are highlighted which once heard open up other lines of enquiry – not just for the person that mentioned them but for all other characters in the game. As your amnesiac protagonist learns something new about the world, he can take this new found knowledge and go back and discuss it with all previous people he’d met. This artificially extends the game length, but also encourages you to back track as often as you can to learn as much as possible about the game world and the trouble that our Ginger haired cyber punk protagonist has landed himself in. Unfortunately though by the end, the dozens of options mean that finding which key word needs to be mentioned to which person actually ends up being a bit of a chore. The majority of times, questions lead to dead ends, and I found myself wasting an awful lot of time asking random people random things just to find the correct combination and progress. required to progress in the game? this object on this’ which would have been fine if I actually had the object it spoke of. To add insult to injury, most of the times I had actually been in the same room as the required object, only not seen it amongst the background. 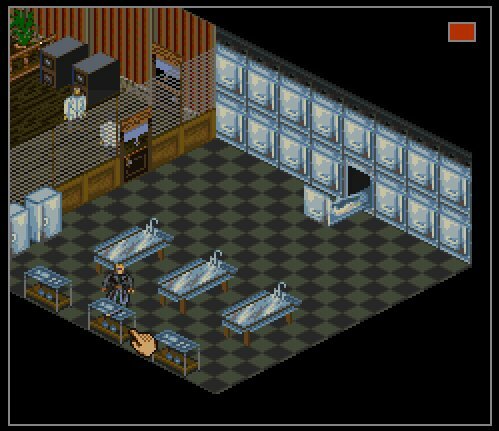 As a result (and as is the tradition on games of this ilk), every new room required me to whisk the cursor over the screen to see which objects are able to be manipulated, and which are simply background decoration. A problem that could have easily been solved, by key objects being clearer, be it through flashing or just being a different colour. Yes this may have had some minor dent in the realism of the game, but at least it would have avoided many people being trapped in a state of limbo, with no clue how to progress next. Searching the screen for these hidden objects is even excessively hard work on a d pad, moving at odds with the isometric view point. It’s certainly a lengthy game – clocking in around 30 hours. But a large proportion of that involves either this random exploration or grinding (optional early on but essential later in the game when the difficulty really does ramp up). a character on a train while sat on a train. using computers. Sounds like boring work? It is. came and literally telling the player that “this game has finished, there’s nothing to see here”. It’s not often you wish for a game to be shorter after having enjoyed it so much, and for the other 29 hours I did really enjoy Shadow Run. A sign of a good game is when you long to get back on the train to play another hour on your commute home. I can see why it’s wasn’t a runaway success, even if it deserved to be; a dark gritty game with its complex intelligent plot. 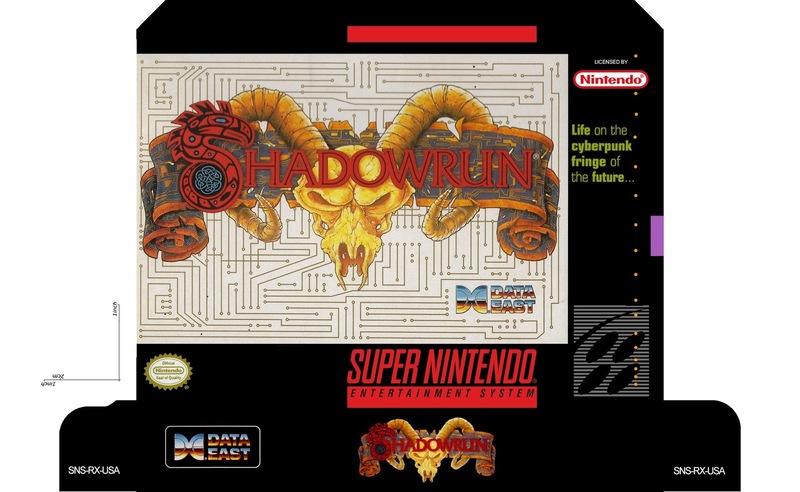 I probably wouldn’t have enjoyed Shadow Run upon release; attention and patience is not something a 10 year old has. But as a 31 year old I really enjoyed it, and I’d bet it only improves with that repeated plays. How did I acquire this? About a year ago, a crossed paths with a great guy on Twitter whom I now actually seem to spend more time chatting to that I do any of my real life friends. Not surprising when we share very similar interests and are at a very similar point in our lives. It’s great when you meet like-minded people, and don’t have down play how much you like playing games, or the excitement you have winning a certain item on eBay just because it has an un-creased inner tray. This fine fellow recently came across a bounty of games and wanted to share the wealth with his Twitter friends (for a fraction of the price he deserved to get for them). Shadow Run was one of the many I got from him. Sadly though, it did come loose and now lives in a Reproduction box. 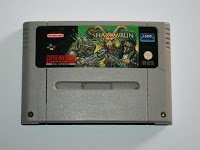 One day I will gladly pay silly money for a genuine boxed complete copy, but it will be the uncensored but fully english Super Famicom version as the European box art is in my eyes embarrassingly awful. Thanks again Paulo, Shadow Run was a great way to spend weeks of commuting. If you too want to make your own Shadow Run box, my photo shopping efforts are below. I went for the NTSC box art, to avoid shame on my shelf!